When words fade, we are left with the heart of the matter, the essential truths unmitigated by the approximations of verbal expression. Words may comprise our main mode of communication, but they often fall short in embodying our innermost emotions, thoughts, and imaginings. This is where music enters: in the spaces between, in the silence. Music captures the ineffable, and that is why it is so undeniably powerful—it gives Read more our deepest and often subconscious feelings shape and flow, as well as a beating, singing heart. Recordings of piano duos may be considered left-field, but they needn’t be strictly for connoisseurs. The original repertoire for the medium includes alluring works by Schubert and Rachmaninoff. Then there are ear-opening arrangements from the days before records, with the piano-duo version of Stravinsky’s Rite of Spring able to make the piece sound even more modernist than the famous orchestration. With the album When Words Fade (Steinway & Sons), Anderson & Roe offer a kaleidoscopic and very contemporary take on how appealing a piano duo can be, as they range from the Baroque to avant-rock. A highlight is their reimagining of Vivaldi’s aria “Sento in seno ch’in pioggia di lagrime” (“I feel within a rain of tears”). One piano is prepared with dampened strings so that its sound approximates the pizzicato of strings and the patter of raindrops; the other piano unfurls a tender melody through that metaphoric veil. At the other end of the dynamic spectrum is Anderson & Roe’s arrangement of Radiohead’s “Paranoid Android,” a dizzying, suite-like epic from the English band’s 1997 landmark album, OK Computer. The song has inspired wildly divergent cover versions, topped by jazz pianist Brad Mehldau’s improv-stoked solo interpretations. Anderson & Roe compel by virtue of the symphonic grandeur and lyrical subtlety of tandem pianos, richly recorded. The duo’s nine-minute fantasia hints at the unhinged qualities of the original even as it underscores the song’s almost operatic beauty. 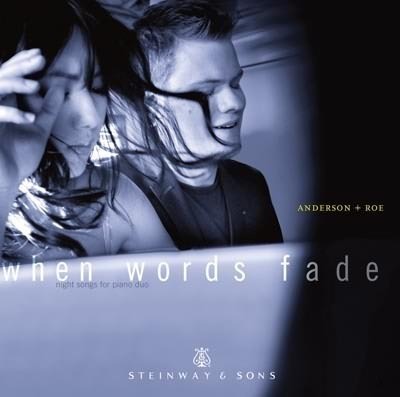 The piano duo team Anderson & Roe's first release for the Steinway label is When Words Fade. As one might expect, it is arrangements of vocal music for piano, 4-hands or two pianos, and what's covered ranges from the Baroque to Coldplay. Anderson & Roe are not only skillful and virtuosic performers, they understand their instruments completely and know how to get just what they want out of them. In the Vivaldi arrangement, it sounds as if they've adopted techniques of preparing one of the pianos to very accurately replicate the sound of a plucked string orchestra. Yet, they know the piano isn't going to replace the instruments in Michael Jackson's "Billie Jean." Instead, they work the song into a fantasy-like setting such as Liszt or Grainger might have done, but retain the steady dance beat and attitude throughout. The Villa-Lobos Bachianas Brasilieras arrangement doesn't try to imitate the sound of the cello ensemble, either; however, although there are some interesting embellishments in it, it doesn't have the warmth or quite the understated passion of the original. Yet most of Anderson & Roe's arrangements not only show off the two musicians' talent, but shed a new light on some familiar music. The physical package comes with a DVD containing videos to go with four of the tracks. These are not just concert performances, but true music videos withstylish direction, where Anderson & Roe's brilliant playing and enjoyment of the music is evident. 3. Papageno! "Fantasy on arias from Mozart's Die Zauberflöte"
9. Bachianas brasileiras no 5 for Soprano and 8 Cellos: Aria "Cantilena"